I could probably fill a bathtub with all the salsa that I’ve made in my life. Growing up in Southern California has made my family as familiar with tortillas and guacamole as bread and butter. Since the recipe for The Food Matters Project this week called for creating your own salsa I wanted to create something that would complement the asian style tacos that we’ve been making lately. I think that this is going to be the perfect thing to pull out our next taco night. 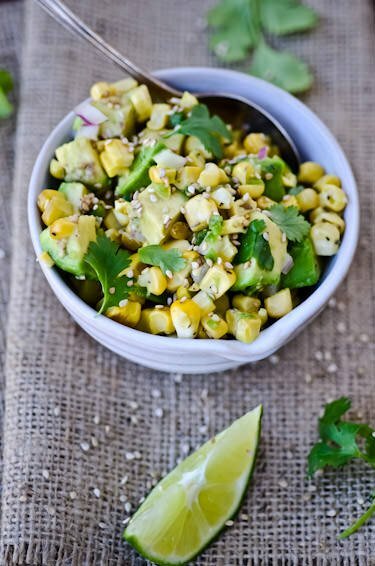 Smoky grilled corn, creamy avocado, sesame seeds, jalapeños and a squeeze of lime makes the perfect salsa to complement a taco or quinoa bowl. 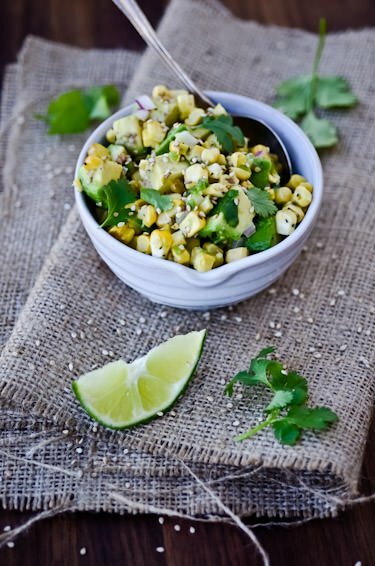 Step outside of the ordinary and try this asian inspired salsa! For the original recipe and all the other versions be sure to visit The Food Matters Project! Prepare a barbecue or grill pan over medium high heat and grill corn under tender and lightly browned about 10 minutes. Let cool while preparing the rest of the ingredients. 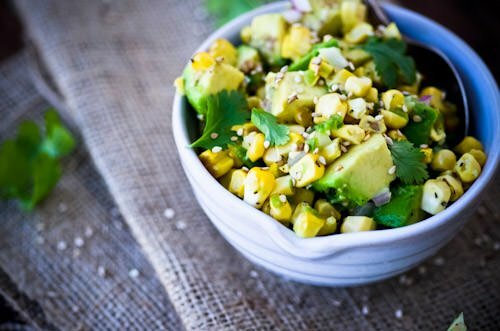 Combine sesame oil, vinegar, lime juice, onion, jalapeño, cilantro and sesame seeds in a small bowl. 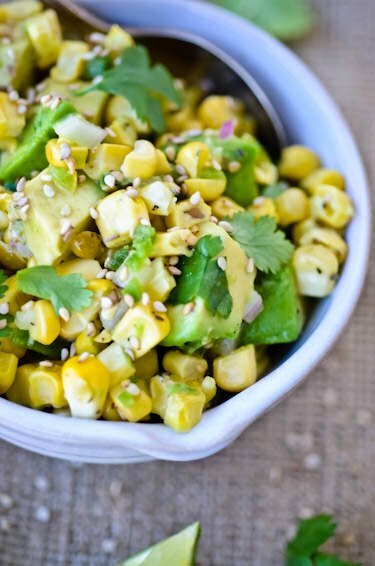 Cut kernels off cobs and add to the mixture along with the avocado; toss gently to combine. Season salsa to taste with salt and pepper and serve. I haven’t seen this recipe before but it is similar! Mine uses jalapeño, cilantro and doesn’t use garlic, chili paste or green onions. I also went a lot lighter on the rice vinegar. Have you tried the other version? Looks so yummy! Wanted to let you know that I’m doing a round up of recipes that I can’t wait to try in the near future, and I’d like to include this one. I will be listing the name of your recipe, linked back to your site, as well as your site name. A photo will bein a collage format only, so that your picture cannot be “swiped” from my site. And there will be no information about the ingredients or recipe steps so that readers must come visit you if they want to know how to make it! This will go live on the 13th; please do let me know if you don’t want me to link to you for some reason. I hope it brings you a lot of traffic! Made this a couple nights ago for dinner and put it on grilled chicken. Also had grilled asparagus. This is a delicious recipe! Thanks! I’m so glad you liked it, especially since the peanut butter recipe didn’t work out for you. We like to put it on top of korean tacos and just snack on it with some pita chips! I can’t wait for summer and the opportunity to make it with fresh corn!